Of course, we all deplore shoplifters, but a couple of times lately I've fallen foul of some of the measures intended to confound them, rather than legitimate consumers. A couple of months back, I found that an unwatched DVD I'd bought a few weeks beforehand still had the security device in place. This is the thing that slots into the side of a standard Amaray case, locking it closed, usually with a security tag inside. Feeling I couldn't be arsed hunting out the receipt and taking it back, I thought to see if I could get the thing out, first with a pair of long-nosed pliers, in the unsuccessful course of which I inflicted a huge blood-blister on my right forefinger. 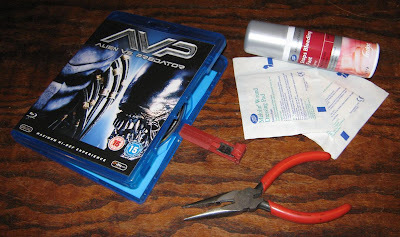 Fast forward to last week, when a late birthday present from a friend was the Blu-Ray disc of Aliens Versus Predator, which I was dismayed to see also had what seemed to be the same sort of security device still in place. This one, however, proved imperious to the magnets that had worked on the first one, and Claire was adamant about not letting me injure myself again. When she took the disc back to the shop, however, the staff - even up to the level of the duty manager - refused to remove the device because, it being a present, she didn't have the receipt! When she got home, I had another crack at it with even stronger magnets than I'd used before, and luckily this time it worked. Obviously the manufacturers had beefed up the mechanism, no doubt because it probably didn't take the real shoplifters long to work out how to get round them. Of course, all this is really a bit academic as regards the Blu-Ray disc, since at the moment we don't actually have anything to play it on. Our half-joke of putting a Sony PS3 on our wedding list did actually pay off (thanks Dad, Louise, Sara, Barny & Hannah! ), but it and all the rest of the gifts were only delivered last week, and then only to Claire's parents' place in Tunbridge Wells, as most of it is going into storage, pending up moving somewhere bigger. We're going over there the day before we depart for our belated honeymoon in Malta, and will be retrieving the PS3 then, but I doubt we'll get much use out of it before we leave the country. Bah! The London Underground in Films & TV - updates galore! Well, maybe that's overstating the case, but with the wedding now out of the way, and helped in no small part by the acquisition of a standalone drive which allows me to do screengrabs direct from the DVD-RAM discs I normally acrhive on, I've done more work on the site in the last week than I had in the previous year. Various new productions have been added, as well as separate illustrated pages for Love on Wheels (1932), An Affair in Mind (1988), Billy Elliot (2000), Harry & Paul (2008), and - as seen below - No Heroics (2008), as well as corrections and expansions to one of the episode of Strange Report (1969 - now known to have reused footage from The Gentle Gunman), and The Fourth Protocol (1987 - the second Tube sequence in which I previously missed!). The page for the latter should be online before the weekend, along with - hopefully - Waterloo Road (1945), On the Beat (1962), The Liquidator (1965), Otley (1968), and Honest (2000).